A mysterious door is before you, but you can not read the writing to decide what's within. You decide to to turn around and go the other direction before something evil comes and hurts you. The location of the Secret Ninja Training school may be a little tricky to find at first; it is highlighted in the image below. To be able to pay for training at the Secret Ninja Training School, you must pay in red codestones; which can be received by trading in normal codestones at Techo Mountain, purchased from other users via the Shop Wizard or won for winning fights against challengers in the Battledome. There are six types of red codestones, listed below. 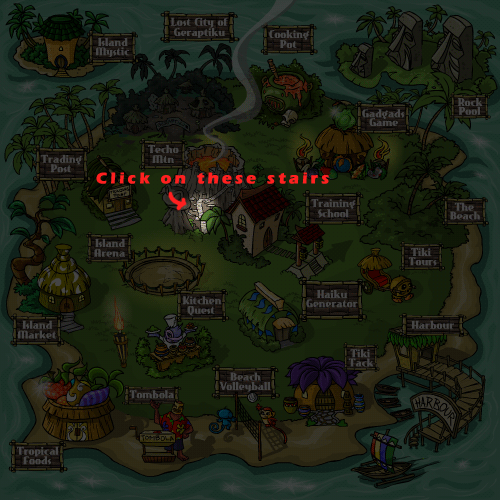 The type of course you must take at the Secret Ninja Training School varies depending on your level, similar to how the regular Mystery Island Training School works. There are six courses you can take, costing from one red codestone to six red codestones, as shown in the screenshot below. To train your pet, select the pet you wish to train on the Courses page; you must pick the (level 250+) pet you wish to train and the type of course you want to take (Strength, Defence, Agility, Endurance, and Level) and then click Start Course. You can cancel courses after signing up, but you will have to wait 24 hours to choose a new one. You will then be brought to the status page, in which the codestones you must use to pay are listed. Once you own all of the codestones listed, you are able to pay by clicking the text "click here to pay". Yes, there is a small shop in the Secret Ninja Training School! You are able to buy battle items in the Secret Ninja Training School, as shown below. (For more information on these items, check this page in the Jellyneo Item Database). There is also a mysterious statue located within the training school. You may donate any number of Neopoints to the statue, and in exchange, you'll receive a pearl of wisdom. There are no other known effects from donating. This page was last updated on December 9, 2018.